As Capt. 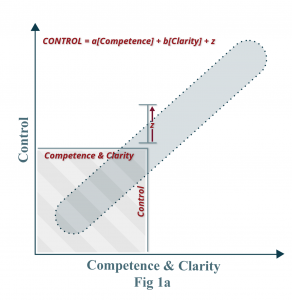 Marquet explains, “z” is the growth factor where the leader is inviting the team to take slightly more control than perhaps is warranted by the exact level of competence and clarity that they have. The greater your “z,” the faster you will develop leaders. The faster you develop leaders, the more you liberate yourself and your organization. Significantly, the size of “z” is a function of (1) the level of commitment to ongoing learning and (2) the atmosphere of psychological safety in the organization (in other words, do you allow them to feel safe when they fail?). Does everyone clearly understand our Core Purpose (our WHY, our reason to exist)? Do we have and follow a very clear set of Core Values (the 3 – 5 behavioral rules that tell the world exactly what we stand for)? Have we clearly communicated to the entire team precisely what we are going to accomplish this year, in 3 – 5 years, and over the next 10 – 30 years? Does everyone know and focus their efforts around the 2 Critical Numbers that drive our success? What is our demonstrated commitment to continuous, ongoing learning and development? To what degree do we subscribe to the principles that “the only time there is at work is time to get better” and “if you’re as good as you’re going to get, you can’t work here”? (For more on these ideas, read “Competent is Not an Option” by Art Turock turock.com). How safe do members of the team feel (truly) when they are challenged to step out of their comfort zone?